Check out this roundup of the best Tucson luxury hotels. Where will you stay next time you need to get away? Description: With an ability to embody the heart and soul of its Sonoran Desert surroundings, The Ritz-Carlton, Dove Mountain offers a sanctuary of natural beauty framed against the Tortolita Mountains. Distinguished from all other Tucson resorts by readers of Travel + Leisure magazine as one of the Top 100 Hotels in the World, guests will discover how easy it is to be inspired by the land revered by the Hohokam Indian inhabitants of centuries past. Description: Tucson’s spectacular ‘Ventana’ or ‘Window’ to the Soul of the Sonoran desert—is Loews Ventana Canyon. Discover a magical perspective high above Tucson’s Catalina Mountains, where this stunning natural retreat offers a variety of activities, signature services and experiences to relax, energize and inspire guests. 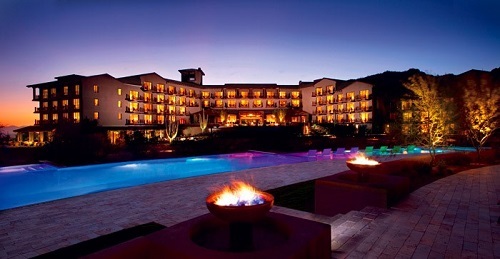 Description: This stunning Tucson resort is nestled against the saguaro-covered foothills of Tucson Mountain Park. It features ample family-friendly recreation, an incredible array of dining options, three nine-hole desert golf courses, a luxury Spa, and over 81,000 sq. ft. of event space. There are also a fabulous array of multi-level swimming pools, waterslides, lazy rivers, and dancing fountains are fun for all ages. With spectacular views, exciting activities for the entire family, and a landscape laced with nature trails throughout for hiking and biking, you’ll make memories that will last a lifetime at this resort. Description: Feel the personal touch and inviting ambiance of one of the most captivating resorts in Tucson by visiting The Westin La Paloma Resort and Spa. As you wind along Sunrise Drive and approach our luxurious property, you’ll feel refreshed by the location – nestled amidst the High Sonoran foothills of the Santa Catalina Mountains. Description: The Arizona Inn is an historic, boutique, resort hotel spread over 14 acres of gardens, fountains, flowers and lawns in the heart of mid-town Tucson, Arizona. The luxury Inn has been continually owned and operated by the same family since its inception under the careful eye of its founder, Isabella Greenway, in 1930, and its casita-style rooms and suites have been robustly maintained and restored ever since, keeping their original warmth, privacy, comfort and charm while gaining all the modern day resort amenities a Tucson guest might desire. So there you have it, a roundup of the best luxury hotels in Tucson.